Some of our favorite books (or books by some of our favorite trainer/authors) are listed below. First, though, you'll note that this post has no photos. Instead, we have a request for each of you - we would love to see your puppy photos! Could you please share a few with us? It's Nearly Time for the Annual Doggie Dash!!! Dogs and snow! That, in itself, is a really fun combination. 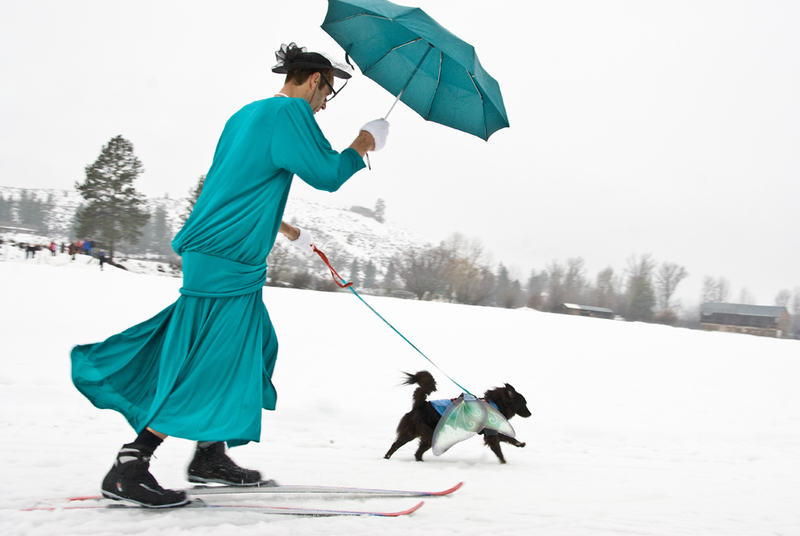 Now add people on skis, and costumes for both the dogs and the people, and there you have it - the fabulous Annual Presidents' Day Weekend Methow Valley Doggie Dash!!!! 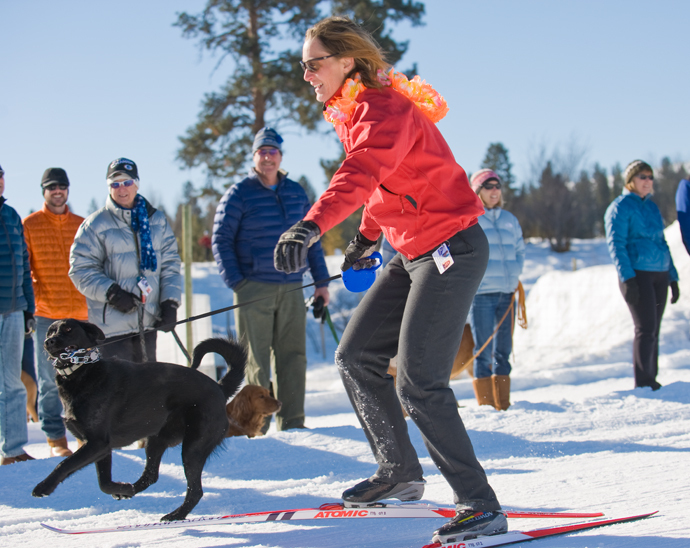 What could be sillier and more fun than kids and adults and their dogs, big and small, competing in a combination costume contest and ski race? We will of course be there to cheer on all the participants and to help hand out prizes! And, of course, we hope to see all of our favorite customers and their human counterparts there too!! Come join in the fun at the Winthrop Town Trailhead on February 14, 2016. Photo with permission, by Teri Pieper, Reflected Light Images. Photo, with permission, by Teri Pieper, Reflected Light Images. 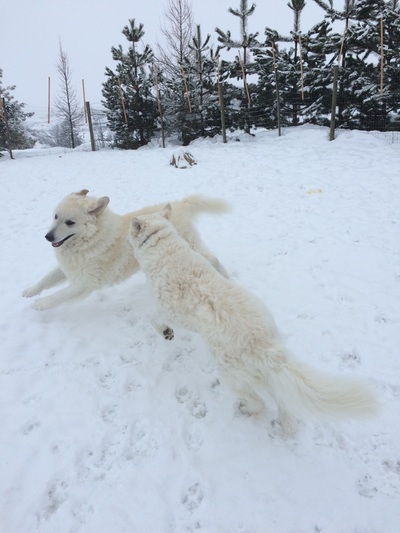 It is confirmed that the two dogs who developed respiratory disease while boarding at a Kent, WA boarding facility in late December/early January were infected with Canine Influenza Virus (CIV) H3N2. The Washington State Veterinary Medical Association (WSVMA) reports that according to the primary care veterinarian, the two dogs did not have fevers, but did have a cough, treatment was minimal and they are now doing well. Since news first came out regarding the southern King County CIV H3N2, Patrick and I have been doing our homework to ensure that we are running Rover’s Ranch dog boarding facility here in the Methow Valley (in north central Washington) safely. We see this as an opportunity to re-assess our protocols. Since the Methow Valley hosts many visitors and their canine companions from the other side of the mountains, we believe this is the prudent thing to do, even though at this time the WSVMA is not aware of any other dogs testing positive for canine influenza in Washington State. We have had numerous lengthy discussions (consultations) with both local and King County veterinarians, and we have been keeping abreast of the news posted on up-to-date, reputable, non-commercial websites: the WSVMA, the American Veterinary Medical Association (AVMA), King County Public Health and the Center for Disease Control (CDC). Two vaccines for H3N2 recently became available and are, at present, conditionally licensed. Canine influenza vaccines are considered “lifestyle” vaccines, meaning the decision to vaccinate is based on a dog’s risk of exposure. Dog owners should consult with their veterinarians to determine whether vaccination is needed for their dog, especially if the dog is in a higher risk group (pregnant, puppy, elderly, immune-compromised or on medication that suppresses the immune system, or history of underlying respiratory or heart condition). What does all this mean if you are planning on boarding your dog? Because the effectiveness and safety of the two conditionally approved vaccines for CIV H3N2 have not yet been proven and because the H3N2 CIV strain is not prevalent enough (two proven cases in Kent, WA) or considered serious enough clinically, there is no current justification to requiring or recommending the vaccines for healthy dogs with social lifestyles. The two vaccines have been determined to reduce transmission and severity of symptoms, but do not prevent dogs from getting the virus or reduce the shedding of the virus by an immunized dog that gets infected. If, upon talking with your vet, you decide that your dog is a candidate for the vaccine, once you begin the vaccination process, you will not want to take your dog to any dog-dense environment for at least five (5) weeks. That is because the H3N2 vaccine requires an initial vaccine and a booster vaccine two to four weeks later, with full immunity expected about one week after the booster vaccine. We value every single one of our customers and prefer to err on the side of caution. We hope we do not cause you inconvenience or create an atmosphere of fear by being proactive. At the present time we have set up the protocols below. We will continue to assess whether these or other protocols are prudent. 1. Whether you are a first-time Rover’s Ranch customer or an ongoing one, please leave your dog(s) in the car when you arrive. 2. 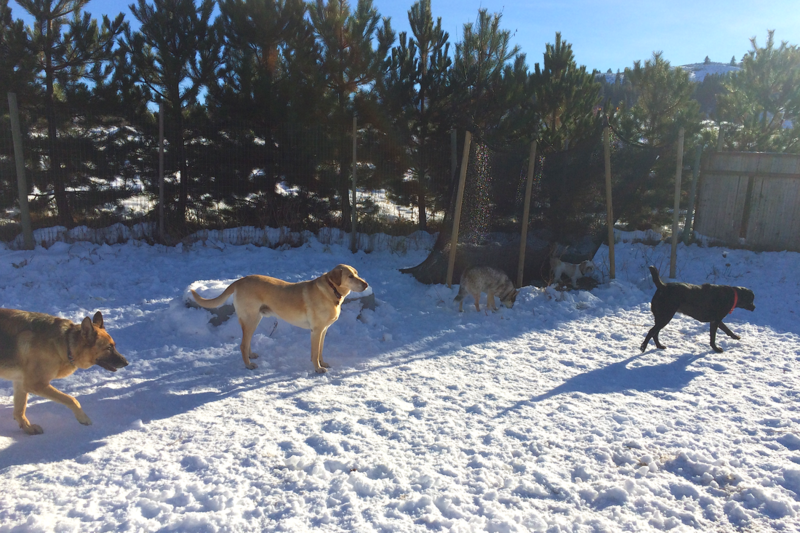 We ask that all dogs visiting Rover’s Ranch from outside the Methow Valley refrain from socializing in dog-dense areas such as grooming or daycare facilities, dog off-leash parks, or training facilities for one week prior to their stay here. Leash walks are completely appropriate during this week. 3. For the time being, until we learn more from King County, as a precaution, we recommend that all dogs who are “at risk” refrain from boarding at the kennel. If you do not know if your dog is considered “at risk,” please contact your veterinarian. 4. If your veterinarian and you determine that the best course for your dog is to receive the conditional vaccines prior to boarding, we support that decision. We ask that you be especially careful to not schedule time at the kennel until your dog is deemed to be fully immunized. 5. We are unable to board any dog that is manifesting any of the following symptoms: coughing, sneezing, discharge from the nose or eyes, lethargy, fever, decreased appetite. ​We will continue to stay abreast of this issue, and we will alert you to any changes in our recommendations or our protocols. Meanwhile, please do not hesitate to contact us if you have any questions whatsoever. 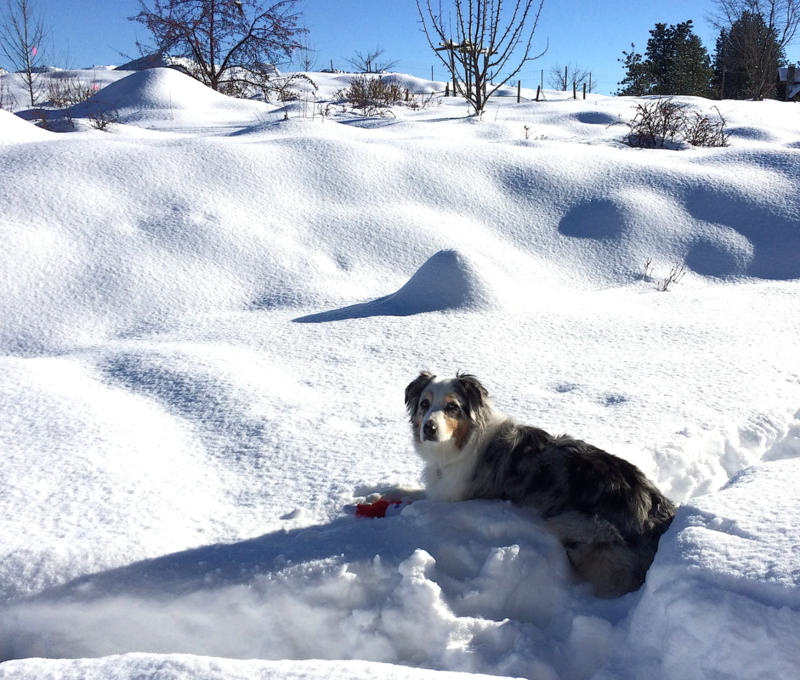 We are relishing the fabulous sunshine and snow out here in the Methow Valley. Dogs and their humans are certainly enjoying getting outside to play in it! Our canine guests are no exception! Because we have doggie visitors from the west side of the state, we wanted to keep all our customers informed that King County is looking into the possibility that dogs in South King County may have contracted canine influenza (tests are pending). This can cause upper respiratory issues, usually mild. As you can imagine, Rover’s Ranch Dog Boarding is a social place for dogs, and we are committed to safeguarding the health of all our canine guests, including your beloved dogs! As a precaution, we are asking our customers to work with us by being aware of their dog's overall health before they travel. We are not able to board any dog that is exhibiting respiratory or flu-like symptoms. If your dog is exhibiting these symptoms, please call your veterinarian and, if you are scheduled to board with us, call us at 509-341-4120. We do not wish to create any concern or inconvenience, and we are happy to say that the risk of complications from this flu is small for the general dog population. Please do not hesitate to call your veterinarian or us if you have any questions about this whatsoever. 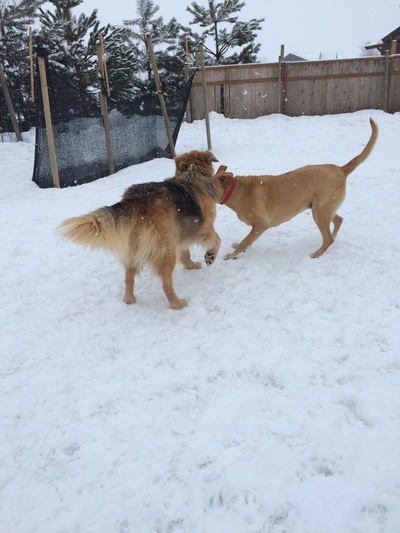 As always, we look forward to playtime with each and every one of our canine customers! Happy New Year everyone! 2015 has arrived, and with the changing of the year, it is a time to reflect upon and to celebrate the many wonderful moments from 2014 and those yet to come. 2014, of course brought us many fun days with all the canine visitors to Rover’s Ranch and with our own dogs, as well. We even joined with our sheep farming neighbors and a talented sheep herding instructor to host a fun-filled couple days of herding lessons. 2014 also was a year of challenges for all of us in the Methow Valley. The year delivered a winter that skimped on the snow followed by a dry, hot summer which culminated in the state’s largest wildfire, a nine-day long power outage, and flooding and mud slides. Through all of this, there was one common denominator that made 2014 a year worth remembering with smiles on our faces: namely, a cohesive and caring community, including our wonderful neighbors, all of the amazing people in the valley who pulled together to fight the fires and help others, and all our wonderful customers - both the dogs and their owners!!! We are so grateful for each and every one of you. We are grateful that we live in a community where individuals can and do make a difference in other people’s lives on a daily basis. And, especially now, with the powdery snow and brilliant sunshine brightening our valley, we are so very grateful to live in this beautiful and wild place! In the dog boarding business we are grateful for the dogs that are playful and love to romp with all the other dogs. Some dogs just have a knack for lightening the mood and getting all the dogs playing! 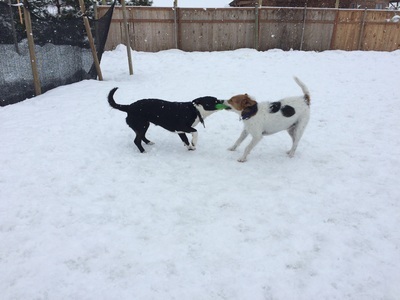 We call these dogs our “party dogs” because no matter where they are or regardless with whom they are playing, these dogs simply have a fantastic time. The day we evacuated in the face of the Rising Eagle fire, we had one dog in particular - a huge one year old mutt of sheep guard dog origins-- Skookum -- who completely dissolved any anxiety the other dogs (or we) were experiencing. What a joy it has been to get to know and interact with this dog and with every single dog who comes through our doors. Each dog has his or her own story and personality. It is a thrill to get to know them all. Pictured below are two of our party dogs, Kiva and Jax. Rover's Ranch is STILL surrounded by green grass and is Open! The beautiful Methow Valley has faced a tremendously difficult fire season. When the Carlton Complex Fire first blew up, Patrick and I came up with several evacuation and contingency plans for all the dogs at Rover's Ranch, just in case. We had no idea we'd have to ever truly evacuate -- the fire was on the other side of the river. Planning is always a good thing, especially in a year like this. On Friday, August 1, we suddenly were faced with having to evacuate all kennel dogs, a boarding parrot, and our own personal dogs and cat. Customers and friends (basically one and the same thing) sped to Rover's Ranch to help us load up all boarders and to move them out of harm's way. What is so remarkable to us is that people from all over the valley came to help or were coming to help as even as we reached our safe destination. Another friend had called 911 to notify authorities that a boarding kennel was in the area to be evacuated. The first people to come to our aid were dear customers and friends who all had lost their homes to the fire two weeks ago. More and more people showed up and we were able to get all dogs loaded up safely for transport. We are so very grateful to everyone who came so readily to help. Planning is a good thing! We took the dogs to a securely fenced and shady area at a friend's house. 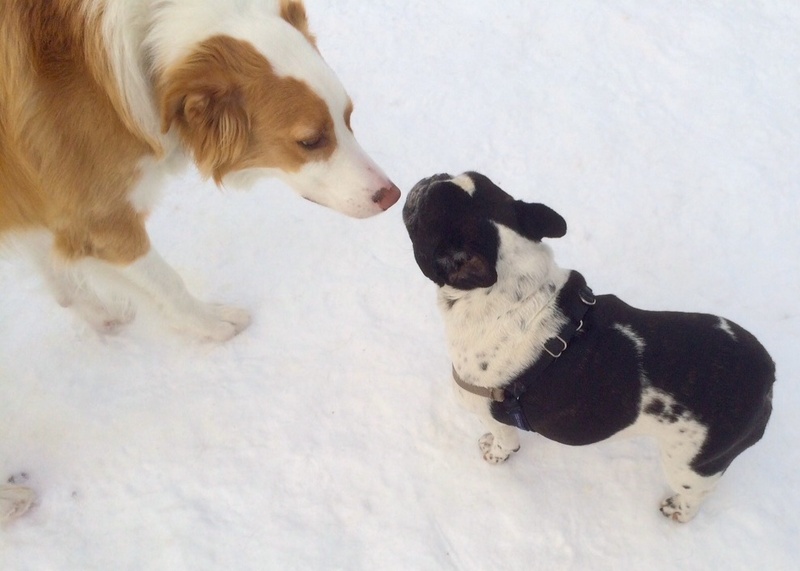 This friend is a dog trainer! The dogs actually had great fun playing in the grassy field. We did not want them to feel any angst. We now are back home with the dogs. (The darling parrot was picked up yesterday.) The fire has been extinguished, thanks to the absolutely amazing work of many, many dedicated, hard working, generous, and brave firefighters. We know a number of the firefighters who strove through the night to contain this fire - known as the Signal Hill Fire. Thanks to all their work, the fire never reached our road, and Rover's Ranch and all it's neighbors, including our sheep farmer whose fields boarder ours, are all, still, thankfully in the green. This fire did, however, destroy other people's homes, including homes of cherished customers/friends of ours. We are so very sorry for their loss. As for Rover's Ranch, we are safe, we are open, we are still handing out free belly rubs (to dogs only), and if push ever did come to shove again, we are happy to know that our evacuation plans worked well! We have email capability again and a new cell phone provider with cell phone connectivity! The cooler temperatures and rain slowed the fire considerably. The last two days have brought clear skies over Rover's Ranch. We are grateful to be able to help with evacuee and firefighter dogs, and are also happy to have regular customers coming for a visit. We are open. We are safe. We are in the green. This has been a very frightening week for all of us in the Methow Valley. Firefighters are continuing to battle the fire and too many valley residents have been displaced or have lost their homes. We offer our support and care. We also offer our extreme gratitude to the many firefighters, Red Cross, and innumerable volunteers. ROVER'S RANCH is OPEN. We are on the other side of the river from the burned areas with a contained line between us. WE have power (generator) and air conditioning. WE DO NOT HAVE EMAIL capability and phones only work if we drive to the high school. BUT WE ARE CHECKING PHONE MESSAGES and getting back as soon as we can. You can reach us at 509-341-4120.